Want to learn more about Lindsay's Carpet & Paint Center ? Click here to view the many products that our store offers learn more about us. 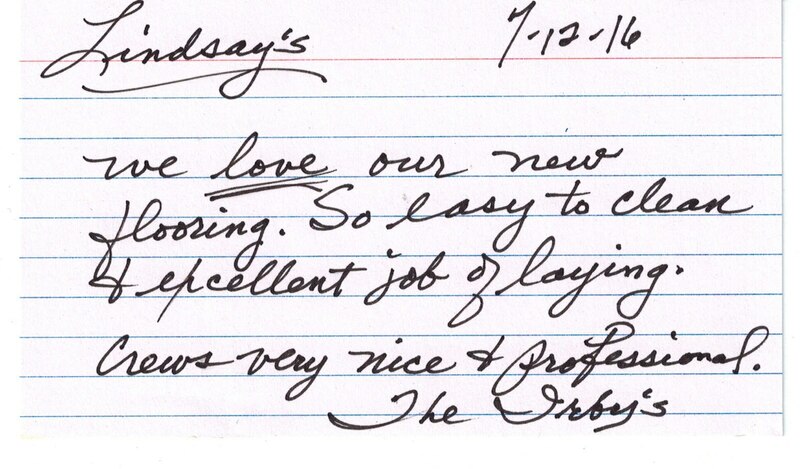 WE WANTED TO WRITE A NOTE TO THAN YOU -ALL FOR THE WONDERFUL JOB YOU DID ON REMOVING AND INSTALLING OUR FLOORS. WE HAVE LIVED IN OUR HOUSE FOR 20 YEARS AND THIS WAS OUR THIRD RENOVATION JOB. 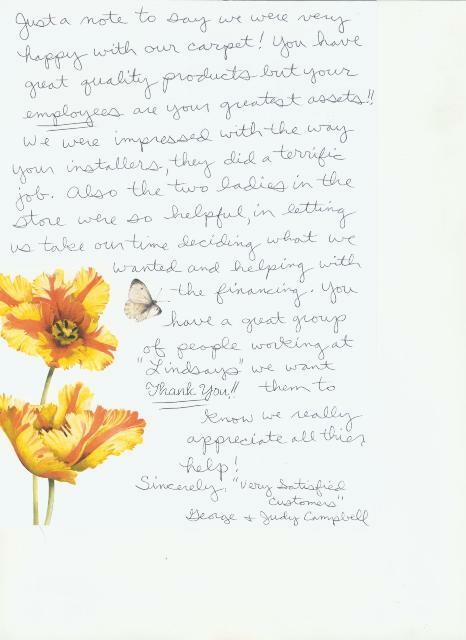 OVER THE YEARS WER HAVE DEALT WITH MANY CONTRACTORS AND WE HAVE NEVER BEEN TREATED AS WELL AS WE HAVE BEEN, BY THE STAFF AND CREW AT LINDSAY'S. SCOTT, YOU ARE THE MOST POLITE, RESPECTFUL, PATIENT AND PROFESSIONAL CONTRACTOR WE HAVE EVER HAD THE PLEASURE OF DOING BUSINESS WITH. CHUCK, JASON AND RED DID A WONDERFUL JOB, AND SO DID RANDY. NOT ONLY DID THEY DO A FANTASTIC JOB, BUT THEY WERE ALL PROFESSIONAL GENTLEMEN. 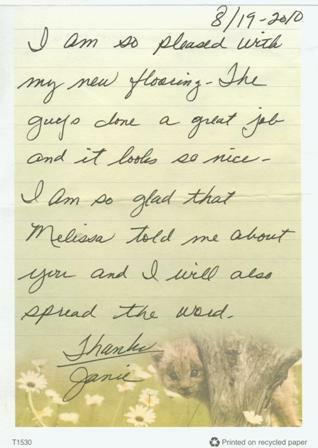 BINNIE WAS ALSO A PLEASURE TO WORK WITH.